SoftPlanet makes it possible for everyone to get free Advanced Onion Router download directly from our servers. There is no registration needed for downloading. 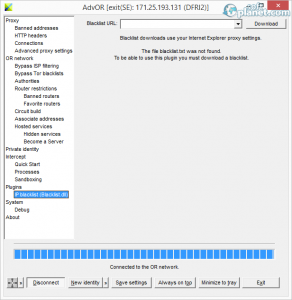 If you need a better proxy server that can do a lot more than Tor, Vidalia or Privoxy you should try Advanced Onion Router. The app is open source, which means that it is free, but also that you can get its source code if you are an advanced user and you need it for some reason. Developer Albu Cristian boasts that Advanced Onion Router can be an alternative of the mentioned programs and he has a point, because it is one very capable application. But most of the features are complicated and best used by advanced users, so you should trust the developer that it can replace other products, because it acts as more than a proxy server. Advanced Onion Router includes many features, like for example it can use UNICODE paths and it has support for HTTP proxy protocols. One of the functions that we liked was that it can use Read-only mode, which means that you can start any media in a mode that will not write anything on your hard drive. The app can also make a list of banned servers and addresses, which means that you can also block ads and unwanted Internet content. The interface of Advanced Onion Router is a bit simplistic, but it contains a lot of features, which makes it somewhat hard to use. In the left part of the main window of the app you have a list of features that you can use and which open like tabbed buttons. The buttons open their main functions in the left part of the screen where you can adjust them according to the function that they perform. At the bottom of the main window of the program you have some additional buttons that can be used to save the settings, change your identity, minimize to tray or to connect and disconnect. If you want to find and know more about any process that is used, Advanced Onion Router offers you Advanced Onion Router Process Finder – a simple utility that can be activated with the mouse cursor. When you activate it you can point at any process that is running at the moment and the program will show you additional information about the process. There are a lot of other functions, but because of the nature of the program they can be used mainly by advanced users. Advanced Onion Router has a lot of utilities, but since it is specialized it's best that these utilities are used by advanced users. Newcomers will have problems with it because it is a bit complicated, but if you are patient enough, even though you are beginner you will be able to grasp its functions and use it for no price at all. Advanced Onion Router is VIRUS-FREE! Our security scan shows that Advanced Onion Router is clean from viruses. The current version of Advanced Onion Router has been scanned by our system, which contains 46 different anti-virus algorithms. That ensures that Advanced Onion Router 0.3.0.19a is 100% safe for your computer.